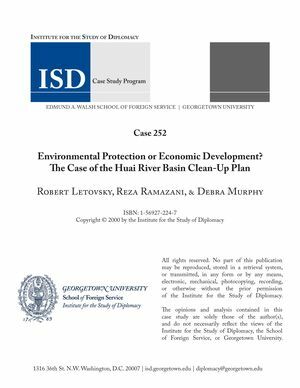 This case study examines the Chinese government’s plan to clean up the Huai River and its surrounding basin, against a backdrop of rapid economic growth, accompanied by large-scale environmental degradation. The Huai River Basin clean-up plan is a microcosm of a broader question: Will China, with its massive environmental problems, be able to avoid a large-scale crisis? Because the plan’s implementation is predicated on a significant level of foreign investment, this study is particularly useful for students of international political economy, environmental and international economics, and economic development.